Today, with trembling cursor and my trusty editor holding my hand via iChat, my first book, A Modern Cellist’s Manual was born. This book was the culmination of my experiences teaching mostly adults. Having largely rebooted my technique as a professional, the tribulations caused by these modifications were fresh in my mind, even ten years on. I began jotting ideas down in 2006 when I was working behind the counter at Baxter Northup. At that point, I had about 10 students and needed to supplement my income by spending the rest of my non-teaching non-playing time any way I could. In retrospect, I could not have asked for a more benevolent and tolerant environment to begin such an endeavor. In exchange for showing up and being fairly helpful, I got a studio to teach in, a stream of referrals, lots of spare time, a flexible schedule, lifelong friends, and the outline of this text. Now I (more or less) make the ends meet by teaching, playing and writing alone. On the other side of this particular journey, the landscape of my life is nearly unrecognizable. I maintain a robust studio of cellists who trust me with their efforts. I have a team of people who have been critical to the success of my teaching, touring, writing and health. I have a blog that keeps me honest and motivates me to keep learning. My arm doesn’t hurt any more. And, with the faintest percussive sound of a Johns Hopkins envelope hitting my mail chute, I have a clear view of the next leg of this journey. Having to produce something for public consumption can be daunting. It’s an opportunity for failure, embarrassment waiting to happen, a glimpse of soft underbelly for our detractors to snipe at. I say let ’em. So long as what we do is not solely for self-aggrandizement, criticism is very informative. Frequently it informs us more about the person issuing the critique than the actual product, but both are useful. Of course I have already started on two more books: the journey was so edifying that I can’t imagine not being on that kind of learning curve in perpetuity. To my readers, my friends, family and students: Thank you. I simply could not have done this without you. YAY! Congrats Emily!!!! BOOOooo – I wanted to be the first one to place an order! Oh CelloGirl, you beat me to it! BOO HOO! hahaha (KIDDING). Got my order in – maybe if I'm lucky Em will sign it or something? Hope springs eternal! Oooo, extra cool pictures. I've seen a lot of cello stuff over my seven years, but those pics/text are the clearest, most explanative I've seen. Destined to become a standard. If I were a teacher, I'd hand one to each student the first day. Download is a BIG file, 450-some meg, but instant gratification. I guess I'll have to settle for a digital signature, though. Favorite line so far: What many teachers don't tell their students is that these seemingly disparate techniques (…, …, …, etc.) are actually all part of a single gesture. It's taken me how many years to start realizing that? Now that I'm trying to write something of my own I know just how hard it is to be an author . . . Congrats! Congrats, Emily! I am a beginning adult cellist. I find that my love of this instrument and the journey of learning to play it is something that is nearly impossible to convey to those who don't possess a similar passion. I love exploring your blog just to soak up your knowledge and love of all things cello. I cannot wait to read and study your book! Great news! I've bought my copy. I'm beyond excited! For me–judging from the above comments, I'm going to love this book. And for you–you're doing what you love (and you're really good at it)! 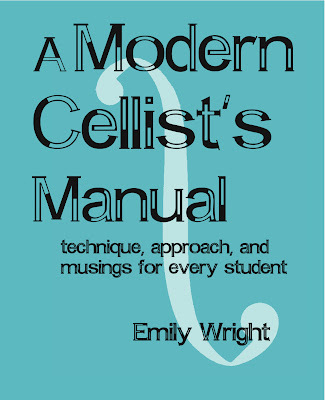 I really hope this book becomes a standard for cello instruction. I am somewhat biased (and very cheerfully so!) but one of the reasons I love this book is for the pictures, too. They're so incredibly clear and illustrative of the technique in question. I am very happy for you Ms. Emily! BTW, the post purchase “thank you” email is a nice touch of class – good job! I look forward to receiving my copy in the mail and adding it to my new “Cello Knowledge” book list! Thanks so much for all of the wonderful comments. I'm still bracing for the first scathing review or insult-laden email. Until then, I just hope it is proving a worthwhile read. Ok, I've finally ordered my copy and am looking forward to reading it! The book is colorfully wonderful. Amazing how having a hand in color on the fingerboard can make something seem easier to comprehend. I bought 2 copies; one for me and one for my cello teacher; will give B her copy this Friday during our lesson. Thanks for publishing this manual! It must be scary to put yourself out there for all to see. Best wishes on your move East. Thanks! That was the whole reason to self-publish. The companies that were even a little interested in my book wanted to take most of the pictures out, most of my personality out of the text, and make the whole thing black and white. While I know that my personality is not suited for everyone, the people who it does resonate with are my market: there are plenty of cello books out there with no pictures and "repeat this passage until you have a fluid, smooth sound" as the instruction. I'm not saying much new stuff, just saying it in my own way, with lots of pictures! Thanks for reminding me that the gamble was worth it: every time I scare myself, I come out better on the other end. I hope this holds true with my move, too!